The installer [1.43 Mb] is not digitally signed and can be downloaded from the following location. The current version of the software is clean from malware and has the following file hash. The installation is clean and quite fast. it requires 4.3 Mb of free disk space and creates a desktop icon and launches the application at installation end. The Software GUI is clean and has no additional settings other than an option to create bootable USB and choose file system. It supports FAT, FAT32, exFAT and NTFS file systems. Although there is no online or offline help documentation, the software usage is easy enough. 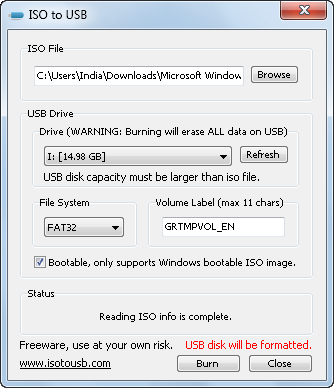 Just browse for the ISO image and select your desired USB. The Refresh helps to find newly connected USB. Once all is done click on Burn to initiate the burning process. You will get two repeated warnings informing that all the data in your USB will be deleted. During the burning process it is detects that either the file or the USB is locked, it will force unlock or unmount those after an warning. The software GUI remained non-responsive throughout the burning process although the burning took place smoothly and at the completion it will give a successful message. The software uses little system resources at idle time and moderately high during burning ISO to USB. I liked the software and will recommend it. A portable version would be handy. I figured out a way to create a portable version by copying the contents of the installation directory [viz. C:Program FilesISO to USB] except unins000.dat and unins000.exe and your can launch the software anytime by executing isotousb.exe. This entry was posted in CD/DVD Management, Format Conversion, Free, Portable, Software, Windows.